Bringing music from Korea to the anglophone world. 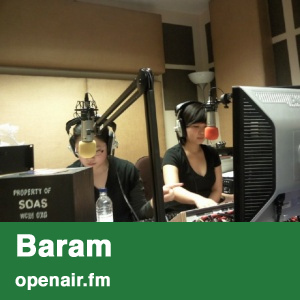 Baram (Korean for ‘wind’, or 'wish') is an English-spoken programme presenting traditional and contemporary Korean music, showcasing all that the country has to offer for listeners around the world. Various musical genres and musicians are covered in the show, in the context of Korea’s history, literature and environment. Baram builds up a complex and diverse picture of everything that has made Korea what it is today. In this bonus episode, Baram showcases songs with very interesting lyrics, focusing on the mimetic or onomatopoeic words in Korean. Baram celebrates the coming of a new year at SOAS and a new season with some Autumnal music from Korea. 01. A slightly heavier episode than usual, with music from the award-winning film 'Old Boy' and rock pieces by The Black Skirts and No Brain. The Baram team bring you a show comprising warm and cheeful pieces, featuring music by the Jazz diva Na Yoon-sun, Jaurim, and Jang Gi-ha (who is gaining a huge popularity in both the indie and pop scenes in Korea). As the weather turns, Baram bring you a lovely little collection of winter warmers to speed the seasons on their way. Music from N.EX.T., Hyun Jin-Young and the Talented Boys' 2003 self-titled album. Bringing you the typically diverse range of music listeners have come to aspect, episode 5?s theme is modern city life in Korea. With music by Rollercoaster, Rain and more. Baram focuses more on the contemporary scene in this episode, with music by W & Whale and Panic (a Baram favourite) amongst others. 15 different versions of one of Korea?s most well-known and beloved folksongs, Arirang. Selections of some of the hundreds of localised traditional variations sit side-by-side indie pop interpretations. Recorded in March, the beginning of both the springtime and new school year in Korea, and featuring music about, and inspired, by spring from artists such as Ggot Byul and Maya. An introduction to Korean music of all varieties, ranging from the traditional to contemporary pop, the first episode is a taster of what?s to come in the series.